Milestones in project management are a tool used to define important events in the life of a project. You can think of them as signal posts or flags marking the key events of a project including: the start of a project, the completion of a project, delineating two project phases, an internal review point, a financial review point, and much more besides. In fact, you can use a milestone to mark any key point in your project, you are only limited by your imagination. Another way to think of milestones is as a gate you must pass through to get from one phase of a project to the next. In the gate, the project manager and the steering committee (including the project sponsor) get together and ask has everything that should have been done in this phase actually been done? If it has, and the project is still viable then the project sponsor with give the project manager authorization to pass the gate and commence the next phase of the project. In essence, project milestones are the building blocks we use to measure progress towards successful completion of our project. We also use milestones in our lives, for example, in our careers getting our first job is a huge milestone, followed by getting our first promotion, moving from a technical role to a management role, moving from management into leadership, and finally retirement. Each of these is a milestone that we work towards, celebrate, and then construct our plans to move to the next milestone. In these two images showing different examples of milestones, you can see that the two projects have very different milestones. 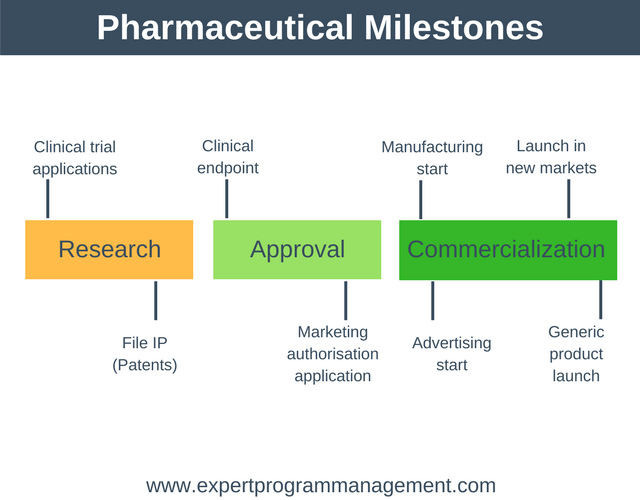 In the clinical trials project example the first milestone is “Clinical trial applications” whereas in the software project the first milestone is “Capture requirements”. In fact, in the examples above, even the phases the two projects each go through are very different. The milestones you’ll use in managing your projects will depend on both the size and complexity of the project you’re managing, as well as the size, complexity, and project guidelines within the organization in which you’re working. In general, the more complex your project the more milestones you’ll have and the more difficult it will be to achieve (or pass in the case of a gating milestone) that milestone. To bring all of this together we’re going to examine one final example showing a real Gantt chart containing milestones, for a simple project plan to move a company’s office from one site to another. There is a milestone to indicate that the move has been fully arranged (Move Arranged). At this point the project manager will likely call a meeting with the project sponsor and steering committee to go through all the plans for the move and ensure that everything that should have been done to arrange the move, is in fact done. If it is then the gate has been passed and the project can move onto the next phase, Manage (Move). There is a milestone to indicate the the office move is complete (Move Complete). Again a meeting would likely be called at this milestone to ensure, for example, that nothing was left behind at the old premises, that all computers in the new premises are working as they should etc. If some outstanding issues were found to exist then this milestone wouldn’t be passed until we went back and fixed these issues. Finally, there is a milestone to celebrate the move. This isn’t a gate, instead it’s just a flag to indicate that this is happening. This milestone also marks the end of the project in our example. In this article we’ve shown that milestones in project management are use to flag important events that happen during a project’s lifetime. Milestones can also sometimes be gates that have to be passed before we move on to the next phase of a project. 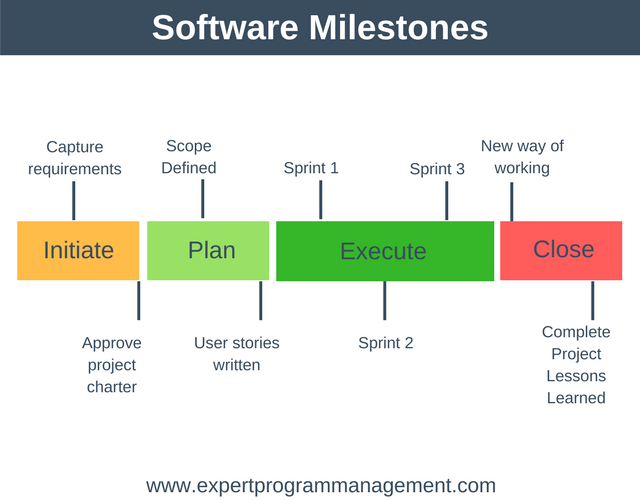 Milestones also exist outside of project management, for example, each of use will achieve key milestones as we move through life. As a project manager how and when you use milestones is up to you, and only limited by your imagination, but generally you’ll use them to indicate important landmarks in the life of the projects you’ll manage.